To view portrait miniatures for sale, please go to www.philipmould.com. John Smart is widely regarded as one of the leading portrait miniature painters of the eighteenth century, a highly prosperous period for the miniature painter which also saw the success of Cosway and Engleheart to name just a few. The present works are attributable to the early stages of Smart’s career, and would have been painted during, or not long after, his apprenticeship with William Shipley in St Martin’s Lane. Smart began the apprenticeship in 1755, the same year as the first Society of Arts competition, which gave him a stage on which to show his talent. In the 1755 exhibition Smart won second prize, and in all three of the following years won the first prize award, finally becoming an exhibitor there in 1762. These early years provided Smart with the necessary confidence, contacts and drive, and in 1765 he was elected Fellow Royal Society of Artists (FSA), becoming director in 1772, Vice-President in 1777 and finally President in 1778, a position he held until the society’s liquidation. The brothers shown in this these miniatures were probably from a branch of the Morgan family of Tredegar, Monmouthshire, whom we know Smart painted later on in his career and show them in military regalia, a fashion of the times rather than a symbol of their military prowess or official uniform. 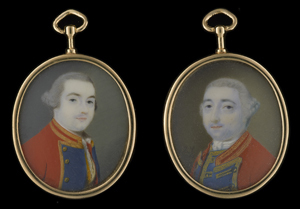 The importance of these two miniatures, dated 1760 and 1762 respectively, is particularly apparent when one considers how the earliest known miniature by Smart (formerly in the Wellesley Collection) is dated 1760, the only other example extant in the Starr Collection (cf. Ed. Graham Reynolds, The Starr Collection of Miniatures, Kansas, 1971, coll.no.85, illus. p. 36). The slight bluish tinge to the shading in the face is characteristic of Smart’s early style between 1760-66, later adopting the more familiar brick-red colour in the face of his sitters.